The Salina South football team felt that they had real momentum after capturing its first win last Thursday over Newton. 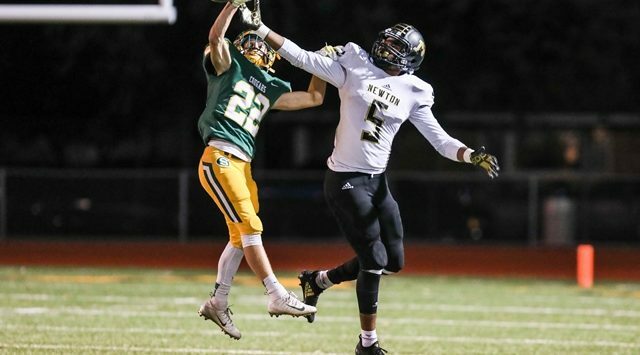 Unfortunately for the Cougars, they couldn’t continue the momentum as they ran in to the top-seed of the class 5A playoffs on Friday night in Wichita Northwest. South saw their season end with an opening round playoff loss, 54-28. Northwest would take the opening drive down the field and score a TD behind star running back, Breece Hall. South answered with a 25-yard Eric Rincon FG on its first drive, however, the unbeaten Grizzlies would rattle off 24-unanswered points to take a 30-3 lead. The Cougars ended the streak with a 16-yard TD pass to Cai Calvert with just over two minutes remaining in the first half. However, they couldn’t keep the potent Grizzly offense out of the end-zone before halftime, with Northwest took a 37-10 lead to the locker room. Northwest continued the hot play offensively in to the second half, while its defense smothered the South offense on their way to a 58-10 lead in the fourth quarter. Wichita Northwest eventually coasted their way to the easy win to open up the playoffs. (1) Wichita Northwest (9-0) has now scored 50 or more points in eight-straight games. The Grizzlies look to keep their state title hopes alive as they will entertain (8) Emporia (5-4) next week in Wichita. Salina South (1-8) scored the final two TDs of the game with a Tarren Galloway 5-yard score and a 60-yard Kyle Quill punt return for a TD in the fourth quarter. The Cougars’ season has now come to an end.